Congratulations, Your Generation Possesses the Truth! I am glad that I have been born in such a generation when it is permitted to disclose the wisdom of truth. 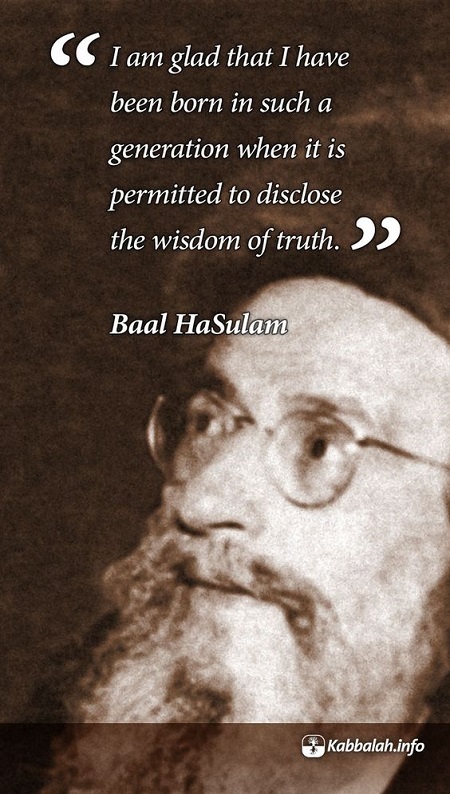 Baal HaSulam. Kabbalists throughout the centuries have concealed this science, waiting until humanity reached a state in its development where it began asking about the meaning of life. We see this now in the great problems of the world– alienation and powerlessness reign in the world. It’s precisely in this generation that the science of Kabbalah must be revealed because from it they will not only understand how to exit the current state, which has left them hopeless, but also to discover what awaits them in the future: an eternal, perfect, whole, exalted state, which is billions of time greater than anything we could ever feel in this world.